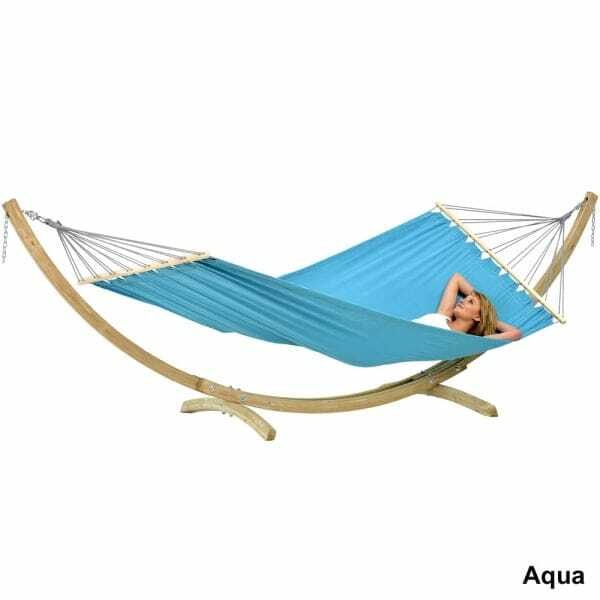 Amazonas Miami Set Aqua with Kronos Stand: This hammock and stand set is excellent value and will provide you with everything you need to create an outdoor oasis in which to relax in the garden. The Miami hammock is large with an ultra-long spreader bar which offers added comfort and ease when getting on and off the hammock. Spreader bar hammocks have a contemporary look to them and will allow you to lay outstretched without being wrapped up inside the material. The kronos hammock stand features European spruce which has been dip impregnated for a long lasting life. The fittings are all galvanised for a rust resistant finish, it also has a specially developed chair suspension to fit hammocks from 270cm – 320cm. The maximum load capacity for this set is 120kg. This set is easy to put together with the stand only requiring basic assembly.